Spotify has confirmed that it has surpassed 60m paying subscribers worldwide – and is growing faster than ever. In the first seven months of 2017 alone, the platform has piled on around 15m subscribers. 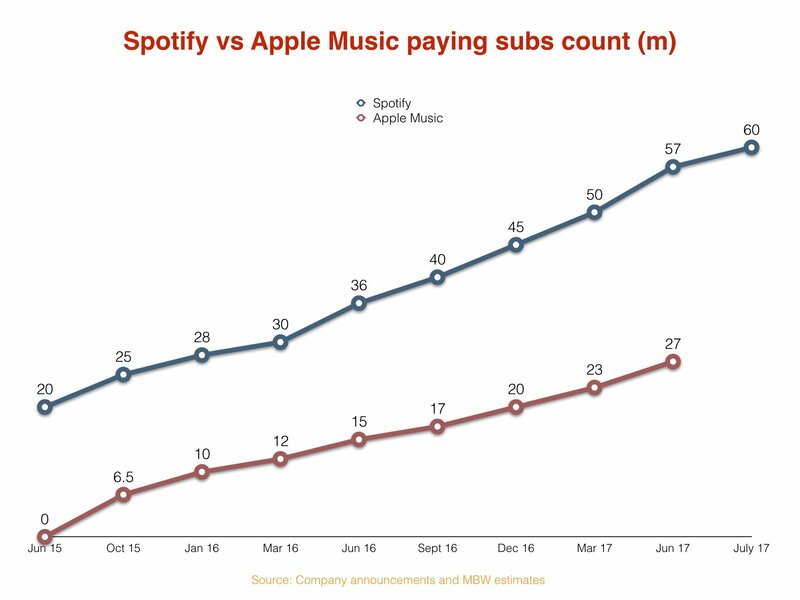 In the same period, Apple Music is believed to have added somewhere approaching 10m subs. The last confirmation we got of a paying subscriber number from Spotify was in early March, when it announced that it had topped 50m subs. The 10m net additional subscribers it has accrued since then have been attracted in less than five months. That means Spotify has been adding an average of more than 2m subscribers per month since that point. Spotify’s latest annual results, filed last month in Luxembourg, showed losses outpacing revenue growth – with 2016’s sales up 52% to $3.3bn but net losses widening 133% to nearly $600m. The company is expected to launch an attempt at a direct listing on the New York Stock Exchange before the end of the year.